It's now been a few weeks since the largest gaming convention in Europe, and arguably the largest board gaming show in the world; International Spieltage in Essen Germany. First off I wish to offer an apology, the whole trip to Essen, the excitement, the lack of sleep and my subsequent daily commute to the day job have meant that I've struggled to write this up. As is usual, there's so much to see at such a large convention that you can't possibly see everything. But let's not dwell on the negatives (at least for now) and let's have a look at everything we saw at the show. The Conan miniatures game, not to be confused with the area control game, was a massive success on Kickstarter and still hasn't made its way to backers but the game was available to play at Essen. By Crom it’s good! Taking a rather new approach to the genre, Conan is an objective based miniatures board game or hybrid game as I like to call them. 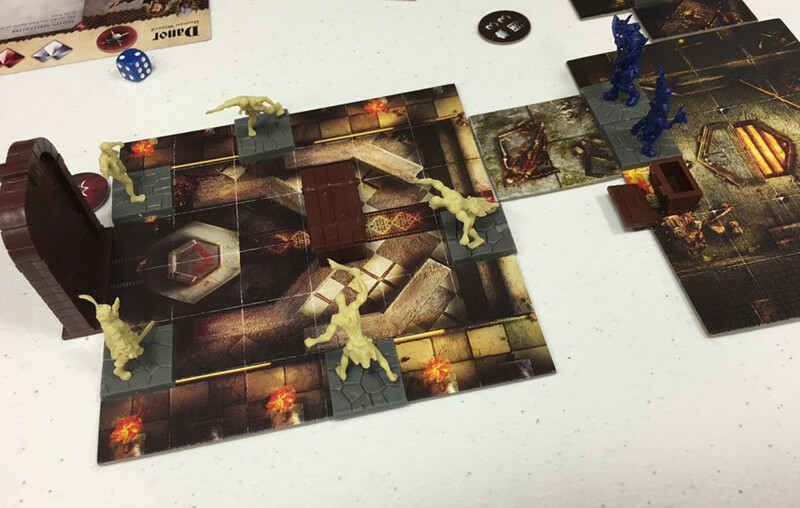 In the beautifully presented demo game at Essen the aim was simply to kill an evil necromancer within a certain number of rounds. In order to drive your enemy before you and hear the lamentation of their women need to spend action points from a pool representing your stamina. Every action beyond the basic movement requires the spending of stamina, and they can also be used for re-rolls or saved for defence. And that's what makes Conan so interesting, because this careful allocation of resources works for both the heroes and the overlord; spend too many action points during your turn and you're not going to have any left to defend against attacks. Overall I was very impressed with Conan, it really felt like the designers had managed to blend euro style resource management into a miniatures game and although dice were still present, there was plenty of opportunity to mitigate the luck with wise use of resources. Thanks to Grim Tree Games for the image. The main problem with Conan, is it felt so fresh and innovative, it was bringing something new to the genre, and it made Dungeon Saga look a little flat. Dungeon Saga is the dungeon crawling game form Mantic, again a big Kickstarter that's on its way to backers soon. This game looks amazing; beautiful miniature sculpts, cool artwork and each tile in the game brilliantly rendered. I also need to give a shout out to the packaging. Instead of being in your industry standard 300 x 300mm box, Dungeon Saga box is a book. It's the dimensions of a book and even looks like a dusty old tome, meaning it will fit on the shelf next to your RPG collection. Dungeon Saga's problem is the mechanics all looked a little pedestrian. Combat was pretty straightforward and the heroes looked well balanced and it would be interesting to see the game in anger, but after seeing the innovation of Conan it all looked a little familiar, like I have already seen this game before. Now this doesn't include any details on the campaign but the basic gameplay didn't feel like anything new. Tabletopia, the new online gaming platform, was out in force at Essen with a particularly large stand. With plenty of PCs showing off the tech I must say I was very impressed. The interface is slick, the graphic fidelity large enough to show everything in crisp detail and the games are built from the ground up. What that means is the games work much like a dedicated conversion would. Tabletopia is currently available as a browser plug in and a steam version will be available soon. People are going to hate me for the analogy but Potion Explosion is the board game equivalent of Candy Crush, and it's a really nice little game. Potion Explosions big attraction is the ingredient drawer, a box with multiple rails where coloured marbles fall down randomly. Each turn you can take an ingredient marble from the draw, and if by removing a marble you force two marbles to touch, you pick them up as well. If you're really clever, observant or just plain lucky, you can start off a chain reaction, and grab a whole hand full of ingredients in the process. As you collect ingredients and brew potions you can also drink the potions to gain bonus and aid you in brewing even more. I have to concede it’s not a particularly heavy game, but there's enough to go beyond the simple gimmick of the ingredients drawer. It was an extremely popular game, so much so Potion Explosion sold out on the 2nd day of the show; here’s hoping more copies are distributed soon. The observant amongst you will notice this game should be called Escape, but there's a reason for that. Scape is effectively The Great Escape the card game, and by simply saying that every British person reading this has started humming The Great Escape theme tune. Scape is a hidden role game where USAF and RAF prisoners of war are trying to escape the camp under the watchful eye of the SS. Mechanically it's a very simple game but plays a huge number of players and concentrates the hidden role into a nice little game. In order to win the players must successfully spell out the word ‘Scape’ with their cards and ensure that the SS officer is nowhere to be seen. At the same time the players are trying to ensure that the top cards contain the most cards of their faction. There’s a lot of competition in the hidden role gaming space at the moment but Scape manages to create a quick and simple game that is more than just simple social deduction. The only issue was everyone playing the game impersonating the SS officer, which was a dodgy thing to try at a German gaming convention. The Curse of the Black Dice, a semi-cooperative dice based game of high seas adventure, was not the only pirate game I played at Essen. You and your rum soaked crew must match the black dice, gaining rewards for the player who contributed the most to each success, but all sharing in the punishment for not. It’s a really simple game to get your head around, but at the same time manages to make you feel like part of a scurvy pirate crew happily working together but ready to screw your crewmates over at a moment’s notice for some shiny gold doubloons. There are a number of different scenarios available, hopefully giving the game plenty of longevity. Well folks, it’s time to take a breather and refresh with a cool glass of pilsner. Essen was just so big a single blog post isn’t going to cover it all, so stay tuned for part two where we’ll have more pirates, more beer, domino rally and spies.